Cunard Line is a British–American cruise line based at Carnival House at Southampton, England, operated by Carnival UK and owned by Carnival Corporation & plc. 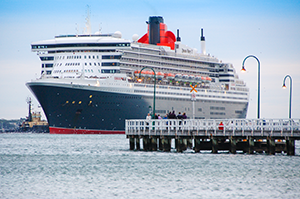 Since 2011, Cunard and its three ships have been registered in Hamilton, Bermuda. In 1839 Samuel Cunard, a Halifax, Nova Scotia, shipowner, was awarded the first British transatlantic steamship mail contract, and the next year formed the British and North American Royal Mail Steam-Packet Company together with Robert Napier, the famous Scottish steamship engine designer and builder, to operate the line's four pioneer paddle steamers on the Liverpool–Halifax–Boston route. For most of the next 30 years, Cunard held the Blue Riband for the fastest Atlantic voyage. However, in the 1870s Cunard fell behind its rivals, the White Star Line and the Inman Line. To meet this competition, in 1879 the firm was reorganized as the Cunard Steamship Company, Ltd, to raise capital. In 1902 White Star joined the American-owned International Mercantile Marine Co. and the British Government provided Cunard with substantial loans and a subsidy to build two superliners needed to retain its competitive position. Mauretania held the Blue Riband from 1909 to 1929. The sinking of her running mate Lusitania in 1915 was one of the causes of the United States' entering the First World War. In the late 1920s, Cunard faced new competition when the Germans, Italians and French built large prestige liners. Cunard was forced to suspend construction on its own new superliner because of the Great Depression. In 1934 the British Government offered Cunard loans to finish Queen Mary and to build a second ship, Queen Elizabeth, on the condition that Cunard merged with the then ailing White Star line to form Cunard-White Star Ltd. Cunard owned two-thirds of the new company. Cunard purchased White Star's share in 1947; the name reverted to the Cunard Line in 1950. Upon the end of the Second World War, Cunard regained its position as the largest Atlantic passenger line. By the mid-1950s, it operated 12 ships to the United States and Canada. After 1958, transatlantic passenger ships became increasingly unprofitable because of the introduction of jet airliners. Cunard undertook a brief foray into air travel via the "Cunard Eagle" and "BOAC Cunard" airlines but withdrew from the airliner market in 1966. Cunard withdrew from its year-round service in 1968 to concentrate on cruising and summer transatlantic voyages for vacationers. The Queens were replaced by Queen Elizabeth 2 (QE2), which was designed for the dual role. In 1998 Cunard was acquired by the Carnival Corporation, and accounted for 8.7% of that company's revenue in 2012. In 2004, QE2 was replaced on the transatlantic runs by Queen Mary 2 (QM2). The line also operates Queen Victoria (QV) and Queen Elizabeth (QE). As of 2019, Cunard is the only shipping company to operate a scheduled passenger service between Europe and North America. The British Government started operating monthly mail brigs from Falmouth, Cornwall, to New York in 1756. These ships carried few non-governmental passengers and no cargo. In 1818, the Black Ball Line opened a regularly scheduled New York–Liverpool service with clipper ships, beginning an era when American sailing packets dominated the North Atlantic saloon-passenger trade that lasted until the introduction of steamships. A Committee of Parliament decided in 1836 that to become more competitive, the mail packets operated by the Post Office should be replaced by private shipping companies. The Admiralty assumed responsibility for managing the contracts. The famed Arctic explorer Admiral Sir William Edward Parry was appointed as Comptroller of Steam Machinery and Packet Service in April 1837. Nova Scotians led by their young Assembly Speaker, Joseph Howe, lobbied for steam service to Halifax. On his arrival in London in May 1838, Howe discussed the enterprise with his fellow Nova Scotian Samuel Cunard (1787–1865), a shipowner who was also visiting London on business. Cunard and Howe were associates and Howe also owed Cunard £300 (equivalent to £26,532 in 2018). Cunard returned to Halifax to raise capital, and Howe continued to lobby the British government. The Rebellions of 1837 were ongoing and London realized that the proposed Halifax service was also important for the military. That November, Parry released a tender for North Atlantic monthly mail service to Halifax beginning in April 1839 using steamships with 300 horsepower. The Great Western Steamship Company, which had opened its pioneer Bristol–New York service earlier that year, bid £45,000 for a monthly Bristol–Halifax–New York service using three ships of 450 horsepower. While British American, the other pioneer transatlantic steamship company, did not submit a tender, the St. George Steam Packet Company, owner of Sirius, bid £45,000 for a monthly Cork–Halifax service and £65,000 for a monthly Cork–Halifax–New York service. The Admiralty rejected both tenders because neither bid offered to begin services early enough. Cunard, who was back in Halifax, unfortunately, did not know of the tender until after the deadline. He returned to London and started negotiations with Admiral Parry, who was Cunard's good friend from when Parry was a young officer stationed in Halifax 20 years earlier. Cunard offered Parry a fortnightly service beginning in May 1840. While Cunard did not then own a steamship, he had been an investor in an earlier steamship venture, Royal William, and owned coal mines in Nova Scotia. Cunard's major backer was Robert Napier whose Robert Napier and Sons was the Royal Navy's supplier of steam engines. He also had the strong backing of Nova Scotian political leaders at the time when London needed to rebuild support in British North America after the rebellion. In May 1840 the coastal paddle steamer Unicorn made the company's first voyage to Halifax to begin the supplementary service to Montreal. Two months later the first of the four ocean-going steamers of the Britannia Class, departed Liverpool. By coincidence, the steamer’s departure had patriotic significance on both sides of the Atlantic: she was named the Britannia and sailed on 4 July. Even on her maiden voyage, however, her performance indicated that the new era she heralded would be much more beneficial for Britain than the US. At a time when the typical packet ship might take several weeks to cross the Atlantic, the Britannia reached Halifax in 12 days and 10 hours, averaging 8.5 knots (15.7 km/h), before proceeding to Boston. Such relatively brisk crossings quickly became the norm for the Cunard Line: during 1840–41, mean Liverpool–Halifax times for the quarter were 13 days 6 hours to Halifax and 11 days 4 hours homeward. Two larger ships were quickly ordered, one to replace the Columbia, which sank at Seal Island, Nova Scotia, in 1843 without loss of life. By 1845, steamship lines led by Cunard carried more saloon passengers than the sailing packets. Three years later, the British Government increased the annual subsidy to £156,000 so that Cunard could double its frequency. Four additional wooden paddlers were ordered and alternate sailings were direct to New York instead of the Halifax–Boston route. The sailing packet lines were now reduced to the immigrant trade. From the beginning Cunard's ships used the line's distinctive red funnel with two or three narrow black bands and black top. It appears that Robert Napier was responsible for this feature. His shipyard in Glasgow used this combination previously in 1830 on Thomas Assheton Smith's private steam yacht "Menai". The renovation of her model by the Glasgow Museum of Transport revealed that she had vermilion funnels with black bands and black top. Cunard's reputation for safety was one of the significant factors in the firm's early success. Both of the first transatlantic lines failed after major accidents: the British and American line collapsed after the President foundered in a gale, and the Great Western Steamship Company failed after Great Britain stranded because of a navigation error. Cunard's orders to his masters were, "Your ship is loaded, take her; speed is nothing, follow your own road, deliver her safe, bring her back safe – safety is all that is required." In particular, Charles MacIver's constant inspections were responsible for the firm's safety discipline. In 1850 the American Collins Line and the British Inman Line started new Atlantic steamship services. The American Government supplied Collins with a large annual subsidy to operate four wooden paddlers that were superior to Cunard's best, as they demonstrated with three Blue Riband-winning voyages between 1850 and 1854. Meanwhile, Inman showed that iron-hulled, screw-propelled steamers of modest speed could be profitable without subsidy. Inman also became the first steamship line to carry steerage passengers. Both of the newcomers suffered major disasters in 1854. The next year, Cunard put pressure on Collins by commissioning its first iron-hulled paddler, Persia. That pressure may well have been a factor in a second major disaster suffered by the Collins Line, the loss of its steamer Pacific. The Pacific sailed out of Liverpool just a few days before the Persia was due to depart on her maiden voyage, and was never seen again; it was widely assumed at the time that the captain had pushed his ship to the limit in order to stay ahead of the new Cunarder, and had likely collided with an iceberg during what was a particularly severe winter in the North Atlantic. A few months later the Persia inflicted a further blow to the Collins Line, regaining the Blue Riband with a Liverpool–New York voyage of 9 days 16 hours, averaging 13.11 knots (24.28 km/h). During the Crimean War Cunard supplied 11 ships for war service. Every British North Atlantic route was suspended until 1856 except Cunard's Liverpool–Halifax–Boston service. While Collins' fortunes improved because of the lack of competition during the war, it collapsed in 1858 after its subsidy for carrying mail across the Atlantic was reduced by the US Congress. Cunard emerged as the leading carrier of saloon passengers and in 1862 commissioned Scotia, the last paddle steamer to win the Blue Riband. Inman carried more passengers because of its success in the immigrant trade. To compete, in May 1863 Cunard started a secondary Liverpool–New York service with iron-hulled screw steamers that catered for steerage passengers. Beginning with China, the line also replaced the last three wooden paddlers on the New York mail service with iron screw steamers that only carried saloon passengers. When Cunard died in 1865, the equally conservative Charles MacIver assumed Cunard's role. The firm retained its reluctance about change and was overtaken by competitors that more quickly adopted new technology. In 1866 Inman started to build screw propelled express liners that matched Cunard's premier unit, the Scotia. Cunard responded with its first high-speed screw propellered steamer, Russia which was followed by two larger editions. In 1871 both companies faced a new rival when the White Star Line commissioned the Oceanic and her five sisters. The new White Star record-breakers were especially economical because of their use of compound engines. White Star also set new standards for comfort by placing the dining saloon midships and doubling the size of cabins. Inman rebuilt its express fleet to the new standard, but Cunard lagged behind both of its rivals. Throughout the 1870s Cunard passage times were longer than either White Star or Inman. In 1867 responsibility for mail contracts was transferred back to the Post Office and opened for bid. Cunard, Inman and the German Norddeutscher Lloyd were each awarded one of the three weekly New York mail services. The fortnightly route to Halifax formerly held by Cunard went to Inman. Cunard continued to receive a £80,000 subsidy (equivalent to £6,957,956 in 2018), while NDL and Inman were paid sea postage. Two years later the service was rebid and Cunard was awarded a seven-year contract for two weekly New York mail services at £70,000 per annum. Inman was awarded a seven-year contract for the third weekly New York service at £35,000 per year. The Panic of 1873 started a five-year shipping depression that strained the finances of all of the Atlantic competitors. In 1876 the mail contracts expired and the Post Office ended both Cunard's and Inman's subsidies. The new contracts were paid on the basis of weight, at a rate substantially higher than paid by the United States Post Office. Cunard's weekly New York mail sailings were reduced to one and White Star was awarded the third mail sailing. Every Tuesday, Thursday and Saturday a liner from one of the three firms departed Liverpool with the mail for New York. To raise additional capital, in 1879 the privately held British and North American Royal Mail Steam Packet Company was reorganized as a public stock corporation, the Cunard Steamship Company, Ltd. Under Cunard's new chairman, John Burns (1839–1900), son of one of the firm's original founders, Cunard commissioned four steel-hulled express liners beginning with Servia of 1881, the first passenger liner with electric lighting throughout. In 1884, Cunard purchased the almost new Blue Riband winner Oregon from the Guion Line when that firm defaulted on payments to the shipyard. That year, Cunard also commissioned the record-breakers Umbria and Etruria capable of 19.5 knots (36.1 km/h). Starting in 1887, Cunard's newly won leadership on the North Atlantic was threatened when Inman and then White Star responded with twin screw record-breakers. In 1893 Cunard countered with two even faster Blue Riband winners, Campania and Lucania, capable of 21.8 knots (40.4 km/h). No sooner had Cunard re-established its supremacy than new rivals emerged. Beginning in the late 1860s several German firms commissioned liners that were almost as fast as the British mail steamers from Liverpool. In 1897 Kaiser Wilhelm der Große of Norddeutscher Lloyd raised the Blue Riband to 22.3 knots (41.3 km/h), and was followed by a succession of German record-breakers. Rather than match the new German speedsters, White Star – a rival which Cunard line would merge with – commissioned four very profitable Celtic-class liners of more moderate speed for its secondary Liverpool–New York service. In 1902 White Star joined the well-capitalized American combine, the International Mercantile Marine Co. (IMM), which owned the American Line, including the old Inman Line, and other lines. IMM also had trade agreements with Hamburg–America and Norddeutscher Lloyd. British prestige was at stake. The British Government provided Cunard with an annual subsidy of £150,000 plus a low-interest loan of £2.5 million (equivalent to £264 million in 2018), to pay for the construction of the two superliners, the Blue Riband winners Lusitania and Mauretania, capable of 26.0 knots (48.2 km/h). In 1903 the firm started a Fiume–New York service with calls at Italian ports and Gibraltar. The next year Cunard commissioned two ships to compete directly with the Celtic-class liners on the secondary Liverpool–New York route. In 1911 Cunard entered the St Lawrence trade by purchasing the Thompson line, and absorbed the Royal line five years later. Not to be outdone, both White Star and Hamburg–America each ordered a trio of superliners. The White Star Olympic-class liners at 21.5 knots (39.8 km/h) and the Hapag Imperator-class liners at 22.5 knots (41.7 km/h) were larger and more luxurious than the Cunarders, but not as fast. Cunard also ordered a new ship, Aquitania, capable of 24.0 knots (44.4 km/h), to complete the Liverpool mail fleet. Events prevented the expected competition between the three sets of superliners. White Star's Titanic sank on its maiden voyage, both White Star's Britannic and Cunard's Lusitania were war losses, and the three Hapag super-liners were handed over to the Allied powers as war reparations. In 1916 Cunard Line completed its European headquarters in Liverpool, moving in on 12 June of that year. The grand neo-Classical Cunard Building was the third of Liverpool's Three Graces. The headquarters were used by Cunard until the 1960s. Due to First World War losses, Cunard began a post-war rebuilding programme including eleven intermediate liners. It acquired the former Hapag Imperator (renamed the Berengaria) to replace the lost Lusitania as the running mate for Mauretania and Aquitania, and Southampton replaced Liverpool as the British destination for the three-ship express service. By 1926 Cunard's fleet was larger than before the war, and White Star was in decline, having been sold by IMM. Despite the dramatic reduction in North Atlantic passengers caused by the shipping depression beginning in 1929, the Germans, Italians and the French commissioned new "ships of state" prestige liners. The German Bremen took the Blue Riband at 27.8 knots (51.5 km/h) in 1933, the Italian Rex recorded 28.9 knots (53.5 km/h) on a westbound voyage the same year, and the French Normandie crossed the Atlantic in just under four days at 30.58 knots (56.63 km/h) in 1937. In 1930 Cunard ordered an 80,000-ton liner that was to be the first of two record-breakers fast enough to fit into a two-ship weekly Southampton–New York service. Work on "Hull Number 534" was halted in 1931 because of the economic conditions. In 1934, both the Cunard Line and the White Star Line were experiencing financial difficulties. David Kirkwood, MP for Clydebank where the unfinished Hull Number 534 had been sitting idle for two and a half years, made a passionate plea in the House of Commons for funding to finish the ship and restart the dormant British economy. The government offered Cunard a loan of £3 million to complete Hull Number 534 and an additional £5 million to build a second ship, if Cunard merged with White Star. The merger took place on 10 May 1934, creating Cunard-White Star Limited.The merger was accomplished with Cunard owning about two-thirds of the capital. Due to the surplus tonnage of the new combined Cunard White Star fleet many of the older liners were sent to the scrapyard; these included the ex-Cunard liner Mauretania and the ex-White Star liners Olympic and Homeric. In 1936 the ex-White Star Majestic was sold when Hull Number 534, now named Queen Mary, replaced her in the express mail service. Queen Mary reached 30.99 knots (57.39 km/h) on her 1938 Blue Riband voyage. Cunard-White Star started construction on Queen Elizabeth, and a smaller ship, the second Mauretania, joined the fleet and could also be used on the Atlantic run when one of the Queens was in drydock. The ex-Cunard liner Berengaria was sold for scrap in 1938 after a series of fires. During the Second World War the Queens carried over two million servicemen and were credited by Churchill as helping to shorten the war by a year. All four of the large Cunard-White Star express liners, the two Queens, Aquitania and Mauretania survived, but many of the secondary ships were lost. Both Lancastria and Laconia were sunk with heavy loss of life. In 1947 Cunard purchased White Star's interest, and by 1949 the company had dropped the White Star name and was renamed Cunard Line. Also in 1947 the company commissioned five freighters and two cargo liners. Caronia, was completed in 1949 as a permanent cruise liner and Aquitania was retired the next year. Cunard was in an especially good position to take advantage of the increase in North Atlantic travel during the 1950s and the Queens were a major generator of US currency for Great Britain. Cunard's slogan, "Getting there is half the fun", was specifically aimed at the tourist trade. Beginning in 1954, Cunard took delivery of four new 22,000-GRT intermediate liners for the Canadian route and the Liverpool–New York route. The last White Star motor ship, Britannic of 1930, remained in service until 1960. The introduction of jet airliners in 1958 heralded major change for the ocean liner industry. In 1960 a government-appointed committee recommended the construction of project Q3, a conventional 75,000 GRT liner to replace Queen Mary. Under the plan, the government would lend Cunard the majority of the liner's cost. However, some Cunard stockholders questioned the plan at the June 1961 board meeting because transatlantic flights were gaining in popularity. By 1963 the plan had been changed to a dual-purpose 55,000 GRT ship designed to cruise in the off-season. Ultimately, this ship came into service in 1969 as the 70,300 GRT Queen Elizabeth 2. Cunard attempted to address the challenge presented by jet airliners by diversifying its business into air travel. In March 1960, Cunard bought a 60% shareholding in British Eagle, an independent (non-government owned) airline, for £30 million, and changed its name to Cunard Eagle Airways. The support from this new shareholder enabled Cunard Eagle to become the first British independent airline to operate pure jet airliners, as a result of a £6 million order for two new Boeing 707–420 passenger aircraft. The order had been placed (including an option on a third aircraft) in expectation of being granted traffic rights for transatlantic scheduled services. The airline took delivery of its first Bristol Britannia aircraft on 5 April 1960 (on lease from Cubana). Cunard hoped to capture a significant share of the 1 million people that crossed the Atlantic by air in 1960. This was the first time more passengers chose to make their transatlantic crossing by air than sea. In June 1961, Cunard Eagle became the first independent airline in the UK to be awarded a licence by the newly constituted Air Transport Licensing Board (ATLB) to operate a scheduled service on the prime Heathrow — New York JFK route, but the license was revoked in November 1961 after main competitor, state-owned BOAC, appealed to Aviation Minister Peter Thorneycroft. On 5 May 1962, the airline's first 707 inaugurated scheduled jet services from London Heathrow to Bermuda and Nassau. The new jet service — marketed as the Cunarder Jet in the UK and as the Londoner in the western hemisphere — replaced the earlier Britannia operation on this route. Cunard Eagle succeeded in extending this service to Miami despite the loss of its original transatlantic scheduled licence and BOAC's claim that there was insufficient traffic to warrant a direct service from the UK. A load factor of 56% was achieved at the outset. Inauguration of the first British through-plane service between London and Miami also helped Cunard Eagle increase utilisation of its 707s. BOAC countered Eagle's move to establish itself as a full-fledged scheduled transatlantic competitor on its Heathrow—JFK flagship route by forming BOAC-Cunard as a new £30 million joint venture with Cunard. BOAC contributed 70% of the new company's capital and eight Boeing 707s. Cunard Eagle's long-haul scheduled operation — including the two new 707s — was absorbed into BOAC-Cunard before delivery of the second 707, in June 1962. BOAC-Cunard leased any spare aircraft capacity to BOAC to augment the BOAC mainline fleet at peak times. As part of this deal, BOAC-Cunard also bought flying hours from BOAC for using the latter's aircraft in the event of capacity shortfalls. This maximised combined fleet utilisation. The joint fleet use agreement did not cover Cunard Eagle's European scheduled, trooping and charter operations. However, the joint venture was not successful for Cunard and lasted only until 1966, when BOAC bought out Cunard's share. Cunard also sold a majority holding in the remainder of Cunard Eagle back to its founder in 1963. Within ten years of the introduction of jet airliners in 1958, most of the conventional Atlantic liners were gone. Mauretania was retired in 1965, the Queen Mary and Caronia in 1967, and the Queen Elizabeth in 1968. Two of the new intermediate liners were sold by 1970 and the other two were converted to cruise ships. All Cunard ships flew the Cunard flag over the White Star flag until late 1968. This was most likely because White Star Line's Nomadic remained in service with Cunard until 4 November 1968, and was sent to the breakers' yard, only to be bought for use as a floating restaurant. After this, all remnants of both White Star Line and Cunard-White Star Line were retired. In 1971, when the line was purchased by the conglomerate Trafalgar House, Cunard operated cargo and passenger ships, hotels and resorts. Its cargo fleet consisted of 42 ships in service, with 20 on order. The flagship of the passenger fleet was the two-year-old Queen Elizabeth 2. The fleet also included the remaining two intermediate liners from the 1950s, plus two purpose-built cruise ships on order. Trafalgar acquired two additional cruise ships and disposed of the intermediate liners and most of the cargo fleet. During the Falklands War, QE2 and Cunard Countess were chartered as troopships while Cunard's container ship Atlantic Conveyor was sunk by an Exocet missile. Cunard acquired the Norwegian America Line in 1983, with two classic ocean liner/cruise ships. Also in 1983, the Trafalgar attempted a hostile takeover of P&O, another large passenger and cargo shipping line, which was formed the same year as Cunard. P&O objected and forced the issue to the British Monopolies and Mergers Commission. In their filing, P&O was critical of Trafalgar's management of Cunard and their failure to correct QE2's mechanical problems. In 1984, the Commission ruled in favour of the merger, but Trafalgar decided against proceeding. In 1988, Cunard acquired Ellerman Lines and its small fleet of cargo vessels, organising the business as Cunard-Ellerman, however, only a few years later, Cunard decided to abandon the cargo business and focus solely on cruise ships. Cunard's cargo fleet was sold off between 1989 and 1991, with a single container ship, the second Atlantic Conveyor, remaining under Cunard ownership until 1996. In 1993, Cunard entered into a 10-year agreement to handle marketing, sales and reservations for the Crown Cruise Line, and its three vessels joined the Cunard fleet under the Cunard Crown banner. In 1994 Cunard purchased the rights to the name of the Royal Viking Line and its Royal Viking Sun. The rest of Royal Viking Line's fleet stayed with the line's owner, Norwegian Cruise Line. By the mid-1990s Cunard was ailing. The company was embarrassed in late 1994 when the QE2 experienced numerous defects during the first voyage of the season because of unfinished renovation work. Claims from passengers cost the company US$13 million. After Cunard reported a US$25 million loss in 1995, Trafalgar assigned a new CEO to the line, who concluded that the company had management issues. In 1996 the Norwegian conglomerate Kværner acquired Trafalgar House, and attempted to sell Cunard. When there were no takers, Kværner made substantial investments to turn around the company's tarnished reputation. In 1998, the cruise line conglomerate Carnival Corporation acquired 68% of Cunard for US$425 million. The next year Carnival acquired the remaining stock for US$205 million. Ultimately, Carnival sued Kværner claiming that the ships were in worse condition than represented and Kværner agreed to refund USD$50 million to Carnival. Each of Carnival's cruise lines is designed to appeal to a different market, and Carnival was interested in rebuilding Cunard as a luxury brand trading on its British traditions. Under the slogan "Advancing Civilization Since 1840", Cunard's advertising campaign sought to emphasise the elegance and mystique of ocean travel. Only the QE2 and Caronia continued under the Cunard brand and the company began Project Queen Mary to build a new ocean liner/cruise ship for the transatlantic route. By 2001, Carnival was the largest cruise company, followed by Royal Caribbean and P&O Princess Cruises, which had recently separated from its parent, P&O. When Royal Caribbean and P&O Princess agreed to merge, Carnival countered with a hostile takeover bid for P&O Princess. Carnival rejected the idea of selling Cunard to resolve antitrust issues with the acquisition. European and US regulators approved the merger without requiring Cunard's sale. After the merger was completed, Carnival moved Cunard's headquarters to the offices of Princess Cruises in Santa Clarita, California, so that administrative, financial and technology services could be combined. Carnival House opened in Southampton in 2009, and executive control of Cunard Line transferred from Carnival Corporation in the United States, to Carnival UK, the primary operating company of Carnival plc. As the UK-listed holding company of the group, Carnival plc had executive control of all Carnival Group activities in the UK, with the headquarters of all UK-based brands, including Cunard, in offices at Carnival House. In 2004, the 36-year-old QE2 was replaced on the North Atlantic by Queen Mary 2. Caronia was sold and QE2 continued to cruise until she was retired in 2008. 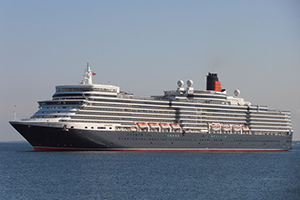 In 2007 Cunard added Queen Victoria, a cruise ship of the Vista class originally designed for Holland America Line. To reinforce Cunard traditions, the Queen Victoria has a small museum on board. 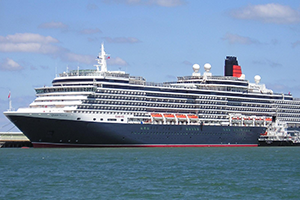 Cunard commissioned a second Vista class cruise ship, Queen Elizabeth, in 2010. In 2010, Cunard appointed its first female commander, Captain Inger Klein Olsen. In 2011, Cunard changed the vessel registry of all three of its ships in service to Hamilton, Bermuda, the first time in the 171-year history of the company that it had no ships registered in the United Kingdom. The captains of ships registered in Bermuda can marry couples at sea, whereas those of UK-registered ships cannot, and weddings at sea are a lucrative market. On 25 May 2015, the three Cunard ships – Queen Mary 2, Queen Elizabeth and Queen Victoria – sailed up the Mersey into Liverpool to commemorate the 175th anniversary of Cunard. The ships performed manoeuvres, including 180-degree turns, as the Red Arrows performed a fly-past. Just over a year later Queen Elizabeth returned to Liverpool under Captain Olsen to take part in the celebrations of the centenary of the Cunard Building on 2 June 2016. Queen Mary 2. Built: 2003. Gross tonnage: 149,215 GT. Queen Victoria. Built: 2007. Gross tonnage: 90,049 GT. Queen Elizabeth. Built: 2010. Gross tonnage: 90,901 GT. Unnamed. Delivery: 2022. Gross tonnage: 113,300 GT.